Classic Cartoons: The Essential reason to buy "The Essential Daffy Duck"
The Essential reason to buy "The Essential Daffy Duck"
A few hours ago I got my copy of “The Essential Daffy Duck”. I bought it and it was a bet. I was curious if WB would have done it. You know, the people at WB are able of anything. I was scared to find myself with a set full of cartoons I already own plus a computer colorized copy of a classic short I’ve always loved. Luckily, as you can see, they did it right. 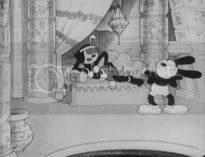 The cartoon appears to be restored in its black and white uncut glory. As far as I know they tried to restore it for one of the LTGCs but the short required a lot of additional work to be properly restored. And the magnificent results can be seen watching these screenshots. Highly recommended to “cwazy” animation aficionados that waited years to have this, restored, on DVD. I'm very surprised that they went to the trouble of restoring this since it's not on the new Blu-Ray set. I'll think about getting this set. Seems as the day of the collectors are gone for now. The new documentary made for "The Essential Daffy Duck" is disgusting, made for children. It is made of clips from cartoon, describing Daffy's life from childhood (!!) to stardom. How sad! "Porky's Duck Hunt" in B&W turned up on one of the WB Cartoon 50th Anniversary VHS tapes back in the mid-80's. The transfer looked sharp but had been sped up... and contained the wrong opening title music. I'm curious to know if the same transfer was used on the new DVD, or if it is truly restored to original theatrical condition. Michael, everything is correct in the cartoon! This is a very interesting new infotainment made for “The Essential Daffy Duck”. It is made from a clip of cartoon characters, it describing the life of Daffy duck, I am just thinking about to getting this set. This is great web site brings memories back thanks!! Is there any definitive list of what's in the LTGC volumes and volumes like this one? Like where there's duplicates, etc., so that one could buy the minimal set in order to get everything that's been released? Oh wow! You don’t know what you have posted here it has awakened me. Really I mean these all were my fav. Cartoons and I love to watch them but now due to busy schedule. It is hard to make out time for them. Vintage Age. I remembered when I used to watch it. Thanks for the posts. Great site, and a great post! Thanks! These guys were part of my inspiration for getting into voice over work. I remember as a kid sitting in front of the TV on Saturday morning cartoons, and imitating their voices...the classics are my favorite -- great job!